To mark its 100th year of publication in 2006, the Sunday Times embarked on a project to erect a trail of memorials across South Africa to commemorate some of the remarkable people and events that made history from 1906 - 2006. As part of this Sunday Times Heritage Project, an innovative online museum was created to showcase these memorials, bringing them together with a rich range of audio, video and archival resources from the last 100 years in South African history. 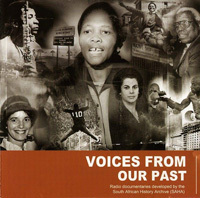 The South African History Archive teamed up with the Sunday Times Heritage Project to identify and contribute archival materials for this online museum, and to develop a collection of multimedia products, including Between life and death: stories from John Vorster Square and Voices from our past, for distribution to educational and heritage organisations. CD of radio documentaries that focuses on key moments in the struggle for democracy in South Africa.